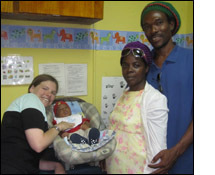 I had the good fortune to find a unique opportunity working with Global Healing International in their pediatric clinic on the island of Roatan, Honduras for the month of March 2010. My primary responsibility was to see patients in the outpatient clinic. I worked alongside a Honduran doctor who was assigned to the clinic for a year after finishing medical school. Patients wait for hours for a number so they can go to the clinic that day and pay the equivalent of 15 cents for a doctor's consult and all their medicines. Our daily duties consisted of seeing babies in the newborn nursery, participating on rounds for the pediatric patients who were hospitalized, and seeing all the patients in the clinic. I was fortunate to receive many generous donations of supplies from local pediatric and dental practices to bring down to the clinic in Honduras. I received an EKG machine to donate to the pediatric clinic, but after finding out there was no EKG machine in the entire hospital, we turned it over to the internal medicine doctors who until now had lacked the ability to diagnose a potentially fatal heart attack using what we consider to be such a basic piece of technology. 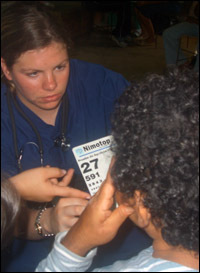 During my month in Honduras, we treated many conditions I had seen and some I had not. We treated children with hookworm induced iron deficiency anemia and empirically treated each child for worms every 6 months. I saw my first case of shingles in an otherwise healthy child. I saw firsthand the challenge of not having the benefit of modern technology when we lost a newborn with Down syndrome who had a heart defect because we had no way to image the heart or ventilate the baby in order to stabilize him enough to life flight him to Tegucigalpa. I learned how to improvise, figuring out how to make a bandage from a paper towel and tape to cover a wound a child got while playing with his father's machete. I hope that we made a difference in the lives of these children, but I know that the lessons I learned there will shape all my future interactions with patients. I know that I have developed a deeper appreciation of other cultures and am learning to rely more on my interviewing and physical exam skills than laboratory tests and radiologic studies to make a diagnosis.